A gratin is any dish that is topped with cheese or breadcrumbs mixed with bits of butter, then baked in the oven or under a broiler until brown and crispy. Special round or oval gratin pans and dishes are ovenproof and shallow, which increases a dish’s surface area, thereby insuring a larger crispy portion for each serving, some people considering this the best part! Vegetable Gratin is a delicious meatless main or side dish. 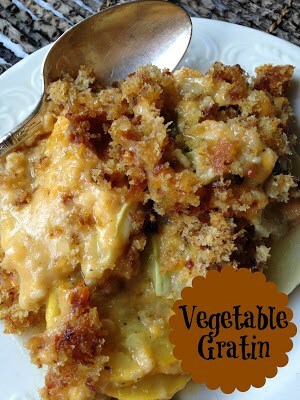 Vegetable Gratin is very versatile. This casserole is an easy to tote dish. Perfect to tote along to upcoming holiday gatherings. Don’t like summer squash? Substitute carrots..or any vegetable your family likes. 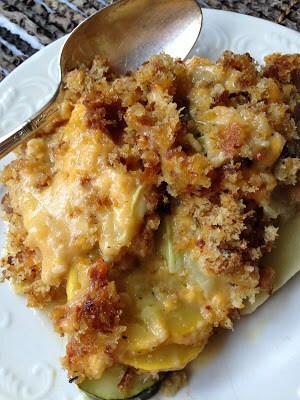 Try this recipe for Cheesy Potato Gratin. Leeks hold a flavorful spotlight in today’s cuisine. Looking like a giant scallion, the leek is related to both the garlic and onion, though its flavor and fragrance are milder and more subtle. It has a thick, white stalk that’s cylindrical in shape and has a slightly bulbous root end. The broad flat, darl green leaves wrap tightly around each other like a rolled newspaper. Leeks are available year-round in most regions. Choose those with crisp, brightly colored leaves and an unblemished white portion. Avoid any with withered or yellow-spotted leaves. The smaller the leek, the more tender it will be. Before using leeks, wash thoroughly to remove all the dirt trapped between the leaf layers. Leeks can be cooked whole as a vegetable or chopped and used in a multitude of dishes. Patty Pan Squash is a round, flattish summer squash with a scalloped edge, which is why it’s also called scalloped squash. Tender young pattypans can be identified by their pale-green skin, which turns white as the squash matures. Small size patty pan squash are 3 to 4 inches in diameter. The thin, smooth bumpy skin, is usually not removed. The pattypan squash can be cooked the same way as other summer squash. Preheat oven to 350º Lightly grease a 2-quart casserole dish, set aside. 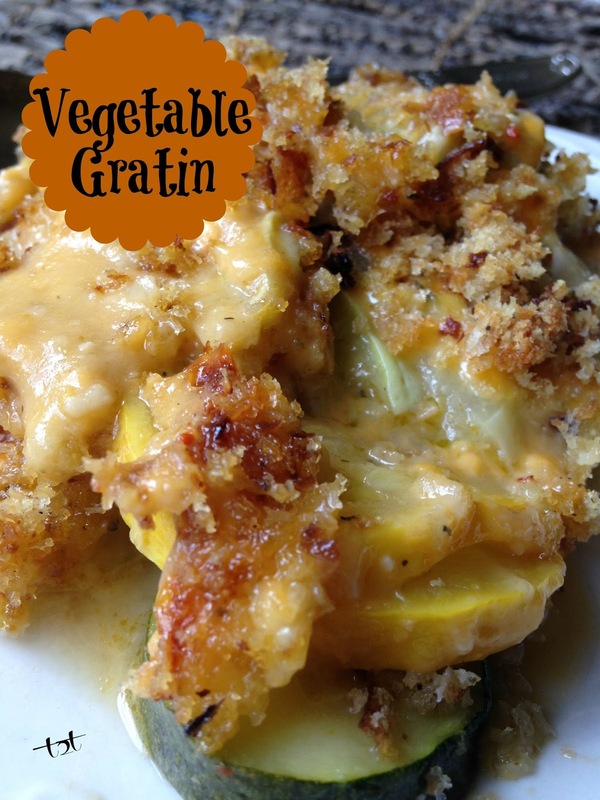 In a medium bowl, combine leeks, zucchini, yellow or pattypan squash. Toss with olive oil. Sprinkle with garlic and herb seasoning. Transfer vegetables to prepared casserole dish. 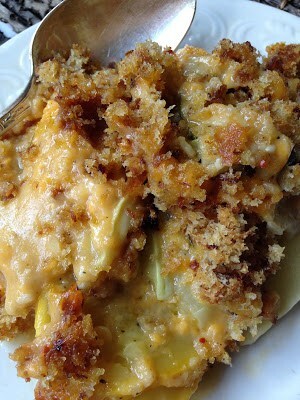 In a small bowl, combine bread crumbs, Parmesan cheese, garlic and herb seasoning and melted butter, set aside. In a medium bowl, combine soup, cheese and parsley, if using. Spoon over vegetables in prepared pan. Sprinkle with breadcrumb mixture. Bake casserole, covered for 20 to 25 minutes. Remove foil, bake an additional 20 to 25 minutes or until vegetables are tender and casserole is heated through. Let dish stand 5 to 10 minutes before serving.